transcript of an interview between NEW ORDER Chief of Staff Martin Kerr and Rosmarie Macleod, host of the online broadcast The Voice of National Socialist Reason. This interview took place on November 4, 2018, on Mixlr, at https://mixlr.com/thevoiceofnsreason. Martin Kerr at the NSWPP headquarters in Arlington, Virginia, 1981. ROSEMARIE MACLEOD: Tell us a little bit about your background. How did you get involved in the Movement? MARTIN KERR: I was born in Pennsylvania in 1952. May ancestors were of Scottish, English and German descent, and helped to settle the state. When I was three or four years old, our family moved to New Jersey. I grew up is a small White suburban community about 20 miles outside of New York City. I had a safe and comfortable middleclass existence. I attended public schools and the local Presbyterian church. I first became interested in National Socialism in 1966, when I was 14 years old. I was aware, through reading the newspapers and watching the news on television, that American society was facing many problems, including racial unrest, the spread of communism and the war in Vietnam. It was also apparent to me that the solutions to these problems did not consist of those offered by democracy, capitalism or the churches – they were the very ones who had allowed the problems to arise in the first place! So I was casting about for solutions. I read an interview with George Lincoln Rockwell and was very impressed by his honesty. Here was someone who was tackling the problems that we were facing – especially racial problems – in a direct and forthright manner. We didn’t use the term back then, but today we would say that he was “thinking outside the box.” I wrote to Commander Rockwell and asked him if I could join the American Nazi Party. Within a week I had received an answer in the mail, and I promptly signed up in the party’s youth wing, the National Socialist Youth Movement, which was the same as the Hitler Youth. As you can imagine, my parents were unhappy with this development, and they prevented any further involvement by me in National Socialist politics for the time being. However, I kept my National Socialist faith, and by my junior year in high school I was attending meetings and demonstrations of the National Renaissance Party in New York City. I was one on the founding associates when party commander Matt Koehl reorganized the NSWPP as the NEW ORDER in 1983. In Commander Koehl’s last will, he indicated that he wanted me to follow him as the leader of the NEW ORDER. I have been in charge of NEW ORDER operations since his death in October 2014. I formally re-affiliated with the NSWPP in 1971. From 1973 through 1977 I served with the Los Angeles Unit of the party. From June 1977 until 1984 I worked at the party’s national headquarters in Arlington, Virginia. My primary responsibility there was public outreach, in particular, editing the party’s written publications. RM: Different people have different definitions of National Socialism. What does it mean to you? MK: There are different levels to National Socialism. What most people understand by the term is its superstructure, that is to say its outward policies and form. In that sense, National Socialism is a dynamic racial movement that seeks to safeguard and advance the interests and welfare of White people both here in the US and worldwide. Using Hitler’s Germany as a model, the NEW ORDER seeks to create a National Socialist state for White Americans. Now, it is not the case that we are trying to replicate the Third Reich on American soil, in the sense of copying it identically in every little detail. 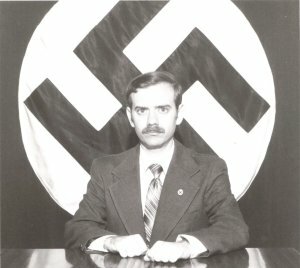 Rather, our goal is to apply basic National Socialist principles in an American context, taking into account America’s history, its racial and ethnic demographics, and its geography, as well as the unique character of the American personality. But underneath this political superstructure rests the philosophical basis of National Socialism, which does not change over time, or from one country to the next. National Socialism is a worldview, or a Weltanschauung, to use the German term. We believe that the Universe is governed by natural laws. For Man to be healthy and prosperous, he must first acknowledge that these laws exist; secondly, he must discern what they are; and finally, he must follow them. This process is true both for individuals and for our race as a whole. My good friend and comrade Povl Riis-Knudsen, the Danish National Socialist, has devised a one-sentence definition of National Socialism that serves very well: National Socialism is the application of the laws of Nature to human affairs. RM: What is the NEW ORDER? What separates it from other pro-White organizations? MK: The NEW ORDER is a vanguard National Socialist organization. Our doctrine is derived directly from Mein Kampf and other Hitlerian sources. Our goal is to promote strict, hardline Hitlerian National Socialism, and not something else. We try to stay on good footing with other pro-White groups that are not National Socialist, and we wish them no ill will. Anything that moves White people in the general direction of National Socialism is worthwhile, in our opinion. But ultimately there is only one movement qualified to lead White people into the future, and that movement is National Socialism, embodied in North America as the NEW ORDER. The NEW ORDER traces its organizational descent directly to George Lincoln Rockwell and the American Nazi Party, later renamed the National Socialist White People’s Party. When Commander Rockwell was assassinated in 1967, party leadership devolved to Matt Koehl. As I mentioned earlier, Commander Koehl reorganized the NSWPP as the NEW ORDER in 1983. So our organizational history goes back some six decades. Also, from our earliest days, commanders Rockwell and Koehl had contact with the remnants of the original Hitler movement in Germany, through comrades such as Arthur Axmann, Otto Remer, Gudrun Burwitz-Himmler, Bruno Ludtke, Hans-Ulrich Rudel, Winifred Wagner, Hans Baur, Florentine Rost van Tonnigen, Hanna Reitsch, Hans Severus Ziegler and others. No other pro-White or National Socialist group has and organizational pedigree that even comes close to ours. I mentioned earlier that we a “vanguard organization.” Our predecessor, the National Socialist White People’s Party, was designed as a mass-oriented political formation. The NEW ORDER, in contrast, does not seek to recruit the masses of people into its ranks, or much less to solicit their support in elections. Rather, we are looking for a small number of highly motivated, exceptional people – an elite – who are fully committed to the National Socialist cause. RM: What is the NEW ORDER’s stand on religion? MK: The NEW ORDER is incorporated in Virginia as a non-profit religious organization. Our leadership views National Socialism as our religion. For us, the tenets of the National Socialist worldview fulfill all of the spiritual requirements for a new religious faith. Sometimes people refer to this as the Hitler Faith or Esoteric Hitlerism. Our critics sometimes claim that we worship Adolf Hitler as a “god,” but this is a misunderstanding or deliberate distortion of our belief. Thus our attitude towards Adolf Hitler is not one of “worship,” as the term is commonly understood, but rather one of veneration. So, this is our belief. But we do not attempt to force our religious insights on our followers. How somebody views the Divine is up to them, it’s a matter of personal conscience. Everyone has to find their own path to God. We have as supporters people who are Christians, or Odinists, or atheists. We even have a few Buddhists. Savitri Devi famously embraced Hinduism. As long as someone is an Aryan and they support National Socialism, they are welcome in our ranks, regardless of religious conviction. Religious intolerance and persecution are un-Aryan. RM: Does the NEW ORDER have a plan? What is its strategy? MK: For obvious reasons, we are not going to reveal our strategy to the public in any detail, but I can speak about it in general terms. Broadly speaking, there are two different strategic approaches that hardline pro-Whites have utilized over the years: the mass-approach and the vanguard strategy. The mass-approach consists on enlisting as many people as possible into the movement as quickly as possible. It is characterized by public demonstrations, publicity seeking, a high media profile and public name recognition. Little or no attention is paid to building a solid infrastructure, nor in ideological development, nor in quality control concerning those recruited. The mass-approach results in a lot of publicity and attention, and in a relatively larger membership. But the organizations that adopt this approach normally do not last long. They are filled with infiltrators and other troublemakers. The publicity that they receive is almost always negative. Their average existence is about two years, after which they disband or fade away, only to be replaced by similar dead-end organizations. This is not the approach that the NEW ORDER is taking. Instead, we are pursuing a vanguard strategy. This is characterized by slow growth and consolidation, by intensive theoretical development, and by careful attention as to whom we recruit. We have small numbers, a low public profile, and little engagement with the media. We spend most of our effort and resources is building a solid infrastructure. Our public activities are limited. Their goal is to spread our message as far and wide as possible among the broad masses of our racial sisters and brothers. We have encountered groups which claim that they pursue both strategies simultaneously, that is, a mass strategy accompanied by intenstive infrastructutal development. But realistically, given the limited resources that pro-Whites have at their disposal, you cannot do both at once; you have to choose one to focus on. Our mid-range goal is to create a nationwide network of local National Socialist communities, which we term folk strongholds. We will have more to say about this in the future. However, as I said before, we do not intend to broadcast our plans to the public. We prefer to boast about our accomplishments after they have been made – not beforehand. RM: How can people help out if they support the NEW ORDER and its beliefs? Where can people go if they want more information on the NEW ORDER? MK: The basic level of affiliation to the NEW ORDER is that of Registered Supporter. An RS is someone who states that they are in agreements with our beliefs and who agrees to pay a monthly financial pledge to help support our operations. They have to fill out a registration form which includes a postal address. The NEW ORDER is an organization that is based in the real world. We have no Registered Supporters who are anonymous, or who are only known to us online. If someone still wants to support our work, but they do not want to make the formal commitment of becoming a Registered Supporter, one thing that they can do is to subscribe to out print publication, the NS BULLETIN. It has been published continuously since 1967. Some people want to support us by making a financial contribution. We are now in the middle of our Fall Building Campaign, the goal of which is to raise $5,000 above our normal income. Donations of any size may be made to our post office box address in the form of check, money order or well-concealed cash. Money orders are a good option for those who want to donate anonymously, but do not trust sending cash through the mail.